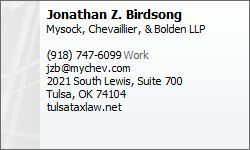 Jonathan Z. Birdsong - Mysock, Chevaillier & Bolden, L.L.P. Jonathan Z. Birdsong graduated from the University Of Tulsa College Of Law in 2010. While attending law school, Mr. Birdsong served as an editor for the Energy Law Journal and concentrated on business and tax law. Prior to his law school graduation, Mr. Birdsong graduated from Louisiana State University with a bachelor of science in accounting. Mr. Birdsong was admitted to the Oklahoma Bar in September 2010 and began practicing with the firm shortly thereafter. Currently, he represents corporations, partnerships, and individuals in negotiations with the Internal Revenue Service and various state taxing agencies. Along with the representative role that Mr. Birdsong provides, he also prepares individual and business tax returns, works with clients to prepare estate plans that meet their financial, tax, retirement, family, and succession goals, and advises corporations, LLC’s, and partnerships with business planning, formation, organizing, and liquidation.